Part-thriller, part-documentary, Bart Layton’s latest shakes up the medium to thrilling, true-life effect. Most of us at some point have wished for a quick solution to life’s banalities. A lottery win, maybe, or a surprise inheritance. In 2004, four unremarkable college students in Lexington, Kentucky wanted a quick fix so badly they came up with a mad idea. They would steal a collection of antique books from the university library, valued at $10 million. What follows is a heist story like no other which, remarkably, is all true. You might remember director Bart Layton from his 2012 doc ‘The Imposter’ – an equally eye-opening tale of a Frenchman who successfully impersonates a missing Texan child. Layton is fascinated by the way that truth and storytelling intermingle. Here he blends drama and documentary. It could have been a mess, but by injecting interviews with the real people into the unfolding drama he pulls it off with panache. The performances are terrific, too. Irish actor Barry Keoghan is remarkable as awkward stoner Spencer. His face, often blank and unreadable, occasionally reveals the growing enormity of the group’s plan. 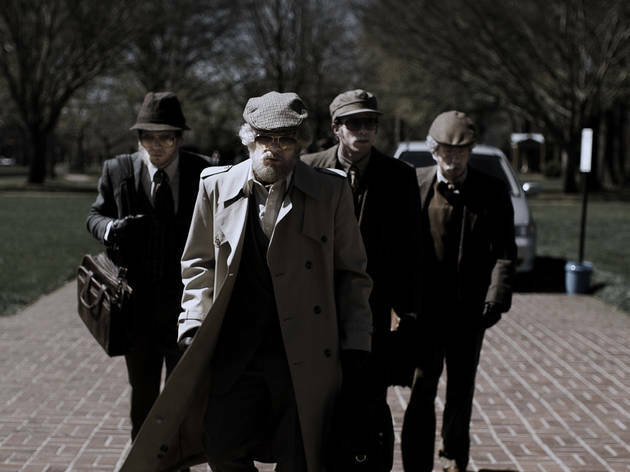 Evan Peters as off-the-rails Warren is equally compelling – his charisma driving the group to their final, ridiculous conclusion. On its release last year the film received considerable critical acclaim but it is difficult see why. 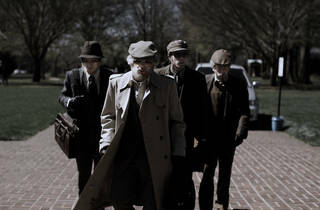 It’s not a groundbreakingly original theme - group of supposedly intelligent middle-class youngsters plot a heist, as much for the thrill of doing a crime and escaping their boring lives as for lots of ill-gotten gains. One of their pointless ideas is to dress up as the most unconvincing group of old men to ever shuffle down the road (hence the picture here). Presumably the makers would say that it’s all based on cast-iron truth so the successive idiocies aren’t the writers’ fault. As irritating a couple of hours you could ever - or more likely not - wish for. Okay it's based on a true story; so I can't really be too angry at the logic flaws and the stupid, stupid decisions and bad planning. Wow for some well educated bright men they were so dumb... and that for me was frustrating. I really am annoyed at the TimeOut reviewer... 5 stars? Ohhh no, very much NOT a 5 star film. It was more frustrating than it was enjoyable.